An EMV card, or chip card, is a standard-size plastic debit or credit card that contains an embedded microchip as well as a traditional magnetic stripe. The chip encrypts information to help increase data security when making transactions at terminals or ATMs that are chip enabled. The chip terminal is installed, but not turned on. Some merchants are not yet allowing any chip cards to be inserted. This will occur frequently in the short-term while terminals are becoming chip-enabled. If you insert your chip debit card and nothing happens, please swipe your card to complete your transaction. 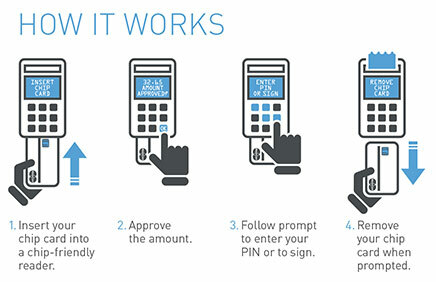 The chip terminal is turned on for chip credit cards only. Some merchants are only allowing chip credit cards to be inserted and plan to allow chip debit cards at a later date. If you insert your chip debit card and nothing happens, please swipe your card and complete your transaction. This does not mean there is anything wrong with the chip on your card.